What really killed Sir Charles Baskerville? Is his nephew, Sir Henry, in danger from the legendary family curse, a gigantic black hound? 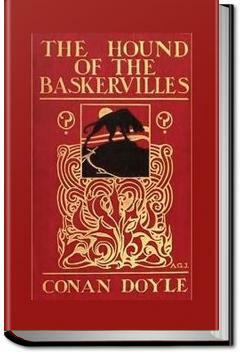 Sherlock Holmes and Dr. Watson are on the case in this classic mystery, set on lonely Dartmoor in Devonshire. Neolithic ruins, a perilous quagmire, eerie sounds in the night, and (of course) fog all add to the fun, with an escaped convict thrown in for good measure. . . .But you know the hotel ink and the hotel pen, where it is rare to get anything else. Yes, I have very little hesitation in saying that could we examine the waste-paper baskets of the hotels around Charing Cross until we found the remains of the mutilated Times leader we could lay our hands straight upon the person who sent this singular message. Halloa! Halloa! What's this?" He was carefully examining the foolscap, upon which the words were pasted, holding it only an inch or two from his eyes. "Nothing," said he, throwing it down. "It is a blank half-sheet of paper, without even a water-mark upon it. I think we have drawn as much as we can from this curious letter; and now, Sir Henry, has anything else of interest happened to you since you have been in London?" "Why, no, Mr. Holmes. I think not." "You have not observed anyone follow or watch you?" 4.5 stars. Sherlock Holmes is at his inscrutable and logical best, Dr. Watson is his devoted self and manages to actually be helpful, and the mystery is a solid one, with a gothic feel to it. And the Baskerville Hound is truly creepy. Notes: It establishes setting in gaps between deductions, treating the moor like a living thing: an alien primordial wasteland. I'd been toying with the idea of reading books in French. I can understand the language - but as for speaking it, well here's another ball game. I read part of this edition in my class when I was 13 years old. I read when the hound was racing towards its would be victim. نعم هذه الرواية تنتمي لعصر النبلاء ..ولكن ..انتظر .. ليس لهذا الحد ..فالمرء قد يفعل الكثير من أجل الميراث..
My Grandpa Cannon loved this story, and he often told of a time when he went to see a "picture show" about the Hound of the Baskervilles. "It scared the willies out of me," he said, and then he and his friend had to part ways as my grandpa rode his bicycle home in the dark. Ahh it's good to be back, I've missed you Sherlock Holmes!